At the Oklahoma Hall of Fame we tell Oklahoma’s story through its people. Founded in 1927, the Oklahoma Hall of Fame was created to honor Oklahomans who had given outstanding service to the state during their lifetime and to provide educational programming for students of all ages. Being inducted to the Oklahoma Hall of Fame is Oklahoma's Highest Honor. Through exhibits and experiences at the Gaylord-Pickens Museum, the Oklahoma Hall of Fame stands to preserve Oklahoma’s unique history while promoting pride in our great state. The Oklahoma Hall of Fame inspires Oklahomans of all ages, instilling state pride by telling the stories of extraordinary people. Each of our programs strive to accomplish that goal. We have hosted the Oklahoma Hall of Fame Banquet & Induction Ceremony each November since 1928. We honor Oklahomans who have contributed to our state’s rich heritage by making strides in their industry and bettering mankind. The Oklahoma Hall of Fame also supports education in a variety of ways, including offering tuition grants and cash scholarships to Oklahoma high school students and hosting Free Field Trips for students from across the state. Oklahoma Hall of Fame Publishing is the leader in publishing Oklahoma's history. At the Gaylord-Pickens Museum, home of the Oklahoma Hall of Fame, visitors can meet notable and inspirational Oklahomans through interactive exhibits. Located in Oklahoma City, the Oklahoma Hall of Fame is a 501(c)3 non-profit organization funded solely by private donations and is governed by a Board of Directors representing the state of Oklahoma. In addition, we have a Teen Board that holds a Free Field Trip fundraiser each year and a Second Century Board made up of young professionals responsible for spreading our mission among their peers. Anna B. Korn founds the Oklahoma Hall of Fame to officially celebrate Statehood Day, recognize Oklahomans dedicated to their communities and state, and promote education programming for all ages. The first Oklahoma Hall of Fame Banquet & Induction Ceremony is held, honoring Congressman Dennis T. Flynn of Oklahoma City and civic leader Elisabeth Fulton Hester of Muskogee. Robert A. Hefner, Sr. donates his home, the Hefner Mansion, to the organization as a facility to display the bust and portraits of Oklahoma Hall of Fame members and give the organization its first permanent home. The Oklahoma Heritage House (Hefner Mansion), home of the Oklahoma Hall of Fame, opens to the public. The organization publishes its first book, The Judge: The Life of Robert A. Hefner, by Clifford Earl Trafzer. 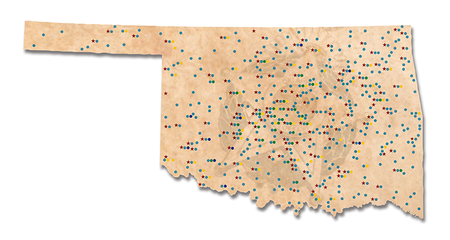 The organization expands the Oklahoma Scholarship Competition to include awarding tuition grants and scholarships to students in every county. The Oklahoma Heritage Plaza is erected on the Oklahoma State Fairgrounds in Oklahoma City, featuring monuments recognizing all members of the Oklahoma Hall of Fame. The organization purchases the historic Mid-Continent Life Insurance Building in Oklahoma City with a gift from Edward L. Gaylord. T. Boone Pickens matches Edward L. Gaylord’s gift, allowing the organization to launch renovations and develop exhibits. The high-tech,interactive Gaylord-Pickens Museum opens to the public. The Teen Board is formed and hosts its first fundraiser, benefiting the Museum’s Free Field Trip program. The board of directors votes to change the Oklahoma Heritage Association to the Oklahoma Hall of Fame to better represent the goals and mission of the organization.